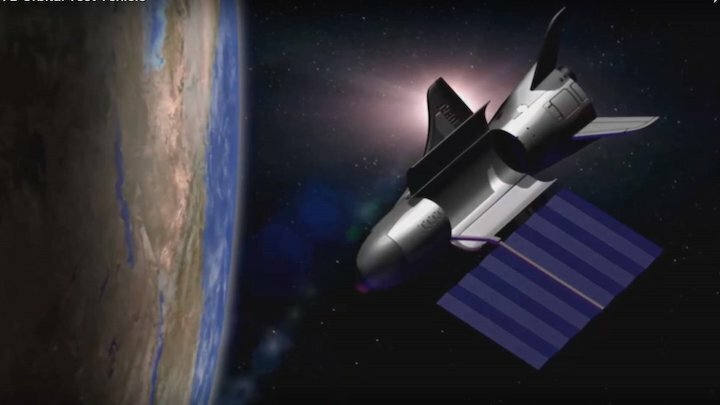 A new video lays out the basics of what the Air Force's robotic X-37B space plane is doing on its latest mystery mission, which lifted off last week. 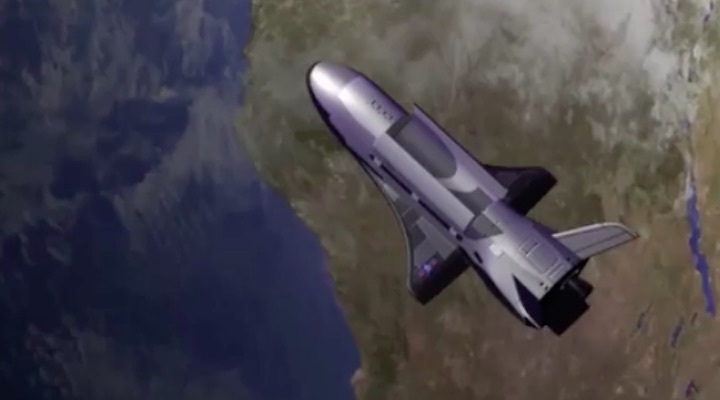 Most aspects of X-37B missions are classified, so the new video — which was produced by Boeing, the vehicle's maker — doesn't go into detail. But it does give a sense of why the Air Force values the reusable space plane so highly. "The X-37B testbed platform is unique because we can tailor our missions to specific user needs and return experiments back for post-flight inspection," Ken Torok, director of experimental systems at Boeing, says in the video. The video was released last Thursday (Sept. 7), the day that a SpaceX Falcon 9 rocket launched an X-37B on the program’s Orbital Test Vehicle (OTV-5) mission. Flights of the craft in the past have repeatedly broken the program's own duration record. The first OTV mission began April 22, 2010, and concluded on Dec. 3, 2010, after 224 days in orbit. OTV-2 began March 5, 2011, and concluded on June 16, 2012, after 468 days on orbit. The OTV-3 mission wrapped up nearly 675 days in orbit when it landed on Oct. 17, 2014. On May 7, 2017, OTV-4 landed at NASA’s Kennedy Space Center Shuttle Landing Facility — a first for the program, as all previous missions ended with a tarmac touchdown at Vandenberg Air Force Base in California. The X-37B conducted on-orbit experiments for 718 days during OTV-4, extending the total number of days spent on orbit for the OTV program to 2,085 days. The Air Force is known to own two X-37B vehicles, which constitute the space plane "fleet." 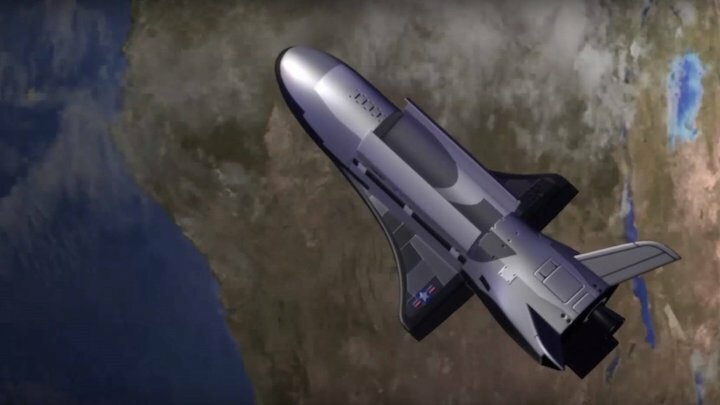 Appearing like a miniature version of NASA’s now-retired space shuttle orbiter, the reusable military space plane is 29 feet (8.8 meters) long and 9.6 feet (2.9 m) tall, with a wingspan of nearly 15 feet (4.6 m). The space drone has a payload bay about the size of a pickup truck bed that can be outfitted with a robotic arm. 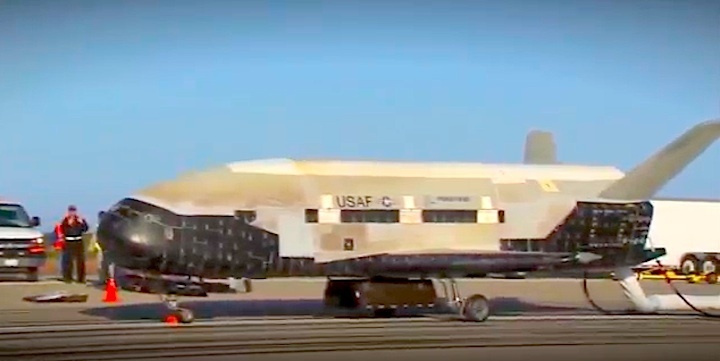 The X-37B has a launch weight of 11,000 lbs. (4,990 kilograms) and is powered on orbit by a solar cell-laden array. Artist's illustration of the U.S. Air Force's X-37B space plane in Earth orbit. One of the vehicles just soared past 200 days in its latest mission, in which it is carrying out classified duties. The U.S. Air Force's X-37B space plane has winged past 200 days in orbit on its latest clandestine mission. That mission, known as Orbital Test Vehicle-5 (OTV-5), began Sept. 7, 2017, when the robotic spacecraft launched atop a SpaceX Falcon 9 booster from NASA's Kennedy Space Center (KSC) in Florida. According to Air Force officials, one payload flying on OTV-5 is the Advanced Structurally Embedded Thermal Spreader, or ASETS-11, of the U.S. Air Force Research Laboratory (AFRL). This cargo is testing experimental electronics and oscillating heat pipes for long durations in the space environment. 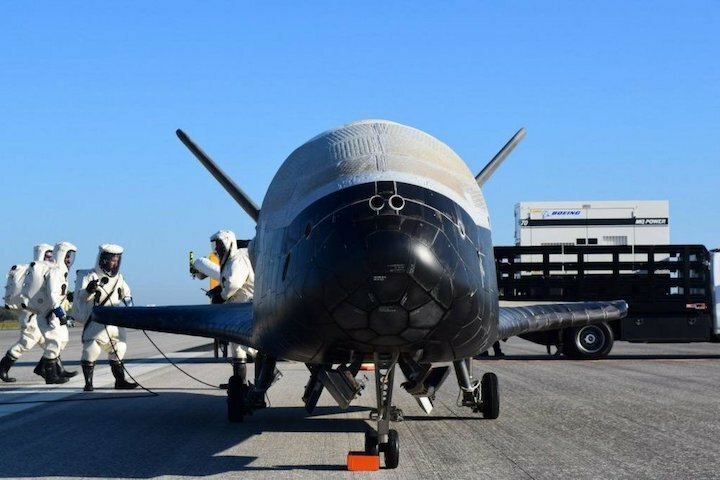 "The X-37B has been and remains a technology demonstrator," said Joan Johnson-Freese, a professor in the National Security Affairs Department at the Naval War College in Newport, Rhode Island. "Given that most space technology is dual-use, with the ever-increasing sway toward warfare in space, it's likely that the more militaristic uses of the space plane will be pursued more vigorously, and likely openly given the [presidential] administration's proclivity toward chest thumping," she told Space.com, expressing her personal view. How long the unpiloted, reusable craft will stay aloft is not known, but experts have said it's likely to land at KSC's Shuttle Landing Facility, as the OTV-4 mission did back on May 7, 2017. That was a first for the program, as all prior missions had ended with a tarmac touchdown at Vandenberg Air Force Base in California. Each X-37B mission has set a new flight-duration record for the program. OTV-1 began April 22, 2010, and concluded on Dec. 3, 2010, after 224 days in orbit. The second OTV mission began March 5, 2011, and concluded on June 16, 2012, after 468 days on orbit. 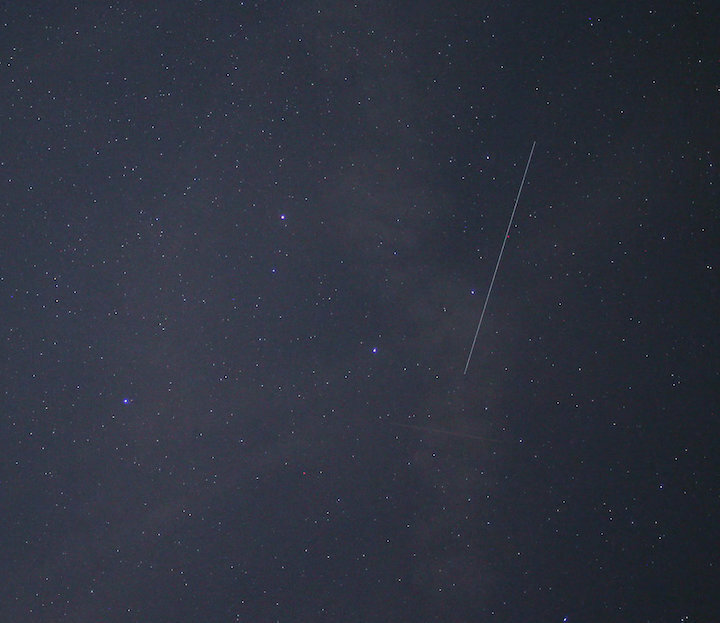 OTV-3 chalked up nearly 675 days in orbit before finally coming down on Oct. 17, 2014. And OTV-4 conducted on-orbit experiments for 718 days during its mission, extending the total number of days spent in space for the OTV program to 2,085 days. The Air Force Rapid Capabilities Office manages the X-37B project, using it to perform risk-reduction, experimentation and concept-of-operations development for reusable space-vehicle technologies. The space drone has a payload bay about the size of a pickup-truck bed, which can be outfitted with a robotic arm. X-37B has a launch weight of 11,000 lbs. (4,990 kilograms) and is powered on orbit by gallium-arsenide solar cells with lithium-ion batteries. The classified X-37B program "fleet" consists of two known reusable vehicles, both of which were built by Boeing. Looking like a miniature version of NASA's now-retired space shuttle orbiter, the military space plane is 29 feet (8.8 meters) long and 9.6 feet (2.9 m) tall, with a wingspan of nearly 15 feet (4.6 m). Specially garbed technicians attend to an X-37B spacecraft after it landed at NASA's Kennedy Space Center in Florida, ending the fourth Orbital Test Vehicle (OTV-4) mission in May of last year. The orbital path of the currently flying space plane is a tad puzzling, said Ted Molczan, a Toronto-based satellite analyst. "There were indications that OTV-5 went to a significantly higher-inclination orbit than previous OTV missions," he told Space.com. "There was too little information to narrowly constrain a search." Molczan said he assisted in one fruitless search, but it was of the roughly 44-degree-inclination orbit implied by the OTV-5 launch's "Notice to Airmen," the routine report put out to warn any aircraft pilots who may be near the flight path. "The final orbit may be more like 60 degrees," he said. "If an object is not found within days or a few weeks of launch, then the trail goes cold and discovery depends on a chance sighting." The U.S. Air Force's X-37B miniature space plane has winged past 340 days in orbit performing secretive duties during the program's fifth flight. The robotic craft's latest mission, known as Orbital Test Vehicle-5 (OTV-5), kicked off on Sept. 7, 2017, with a launch atop a SpaceX Falcon 9 rocket from NASA's Kennedy Space Center (KSC) in Florida. The X-37B has a payload bay about the size of a pickup-truck bed, which can be outfitted with a robotic arm. The space plane has a launch weight of 11,000 lbs. (4,990 kilograms) and is powered on orbit by gallium-arsenide solar cells with lithium-ion batteries. OTV-2 began March 5, 2011, and concluded on June 16, 2012, after 468 days on orbit. OTV-4 conducted on-orbit experiments for 718 days during its mission, extending the total number of days spent in space for the OTV program to 2,085 days. How long OTV-5 will stay aloft is unknown. Whenever it comes down, the robotic vehicle is likely to land at KSC's Shuttle Landing Facility, as the OTV-4 mission did back on May 7, 2017. That was a first for the program. All prior missions had ended with a tarmac touchdown at Vandenberg Air Force Base in California. Ted Molczan, a Toronto-based satellite analyst, told Inside Outer Space that OTV-5's initial orbit was about 220 miles (355 kilometers) high, inclined 54.5 degrees to the equator. "Its ground track nearly repeated every two days, after 31 revolutions," he said. On April 19, the space drone lowered its orbit by 24 miles (39 km), which caused its ground track to exactly repeat every five days, after 78 revolutions, Molczan said — a first for an OTV mission. "Repeating ground tracks are very common," Molczan added, "especially for spacecraft that observe the Earth. That said, I do not know why OTV has repeating ground tracks." "Ironically, the X-37B is exactly the type of program — toward giving the U.S. flexibility of operations in space — that seems to be prompting the current push for a Space Force, yet are already underway," said Joan Johnson-Freese, a professor in the National Security Affairs Department at the Naval War College in Newport, Rhode Island. The Air Force discloses little about X-37B missions, keeping details about the plane's orbit and most of its payloads close to the vest. But Langbroek said he's confident that the light trail he photographed came from the space plane, which is also known as the Orbital Test Vehicle (OTV). he X-37B looks like a miniature version of NASA's now-retired space shuttle orbiter. The Air Force is known to possess two OTVs, both of which were built by Boeing. Each vehicle is 29 feet (8.8 meters) long and 9.6 feet (2.9 m) tall, with a payload bay the size of a pickup truck bed. The latest mystery mission of the U.S. Air Force's robotic X-37B space planehas now passed the 400-day mark . This mission — known as Orbital Test Vehicle (OTV-5) — was rocketed into Earth orbit on Sept. 7, 2017, atop a SpaceX Falcon 9 rocket from Launch Complex 39A at NASA's Kennedy Space Center in Florida. OTV-4 conducted on-orbit experiments for 718 days during its mission, extending the total number of days spent in space for the OTV program at that point to 2,085 days. Most X-37B payloads and activities are classified. The only OTV-5 payload revealed to date by Air Force officials is the Advanced Structurally Embedded Thermal Spreader, or ASETS-II. Developed by the U.S. Air Force Research Laboratory (AFRL), this cargo is testing experimental electronics and oscillating heat pipes for long-duration stints in the space environment. According to AFRL, the three primary science objectives are to measure the initial on-orbit thermal performance, to gauge long-duration thermal performance and to assess any lifetime degradation. When the space plane will land is unknown. The last X-37B mission, OTV-4, touched down at the Shuttle Landing Facility at NASA's Kennedy Space Center in Florida on May 7, 2017 — a first for the program. All prior missions had ended with a tarmac touchdown at Vandenberg Air Force Base in California. The next X-37B mission,B OTV-6, may lift off in 2019 aboard a United Launch Alliance Atlas-V (501) rocket. Launch would be from Cape Canaveral Air Force Station's Space Launch Complex-41. The Air Force's X-37B "fleet" consists of two known reusable vehicles, both of which were built by Boeing at several locations in Southern California, including Huntington Beach, Seal Beach and El Segundo. The program transitioned to the U.S. Air Force in 2004 after earlier funded research efforts by Boeing, NASA and the Defense Advanced Research Projects Agency. Looking like a miniature version of NASA's now-retired space shuttle orbiter, the military space plane is 29 feet (8.8 meters) long and 9.6 feet (2.9 m) tall, with a wingspan of nearly 15 feet (4.6 m). The X-37B space plane has a payload bay measuring 7 feet by 4 feet (2.1 by 1.2 m), which can be outfitted with a robotic arm. The X-37B has a launch weight of 11,000 lbs. (4,990 kilograms) and is powered on orbit by gallium-arsenide solar cells with lithium-ion batteries. The missions of the X-37B space planes are carried out under the auspices of the Air Force Rapid Capabilities Office, and mission control for OTV flights is handled by the 3rd Space Experimentation Squadron at Schriever Air Force Base in Colorado. This squadron oversees operations of the X-37B Orbital Test Vehicle. This Schriever Air Force Base unit is billed as the Air Force Space Command's premier organization for space-based demonstrations, pathfinders and experiment testing. It gathers information on objects high above Earth and carries out other intelligence-gathering duties. And that may be a signal as to what the robotic craft is doing — both looking down at Earth and upward. Ted Molczan, a Toronto-based satellite analyst, told Inside Outer Space that OTV-5's orbit at the start of August was about 197 miles (317 kilometers) high, inclined 54.5 degrees to the equator. Its ground track repeated nearly every five days, after 78 revolutions. "Maneuvers on August 18 and 21 raised its orbit by 45 miles (74 kilometers) which caused its ground track to exactly repeat every three days, after 46 revolutions. It was still in that orbit when last observed, on September 8, by Alberto Rango, from Rome, Italy," Molczan said. "Repeating ground tracks are very common," he added, "especially for spacecraft that observe the Earth. I do not know why OTV has repeating ground tracks." 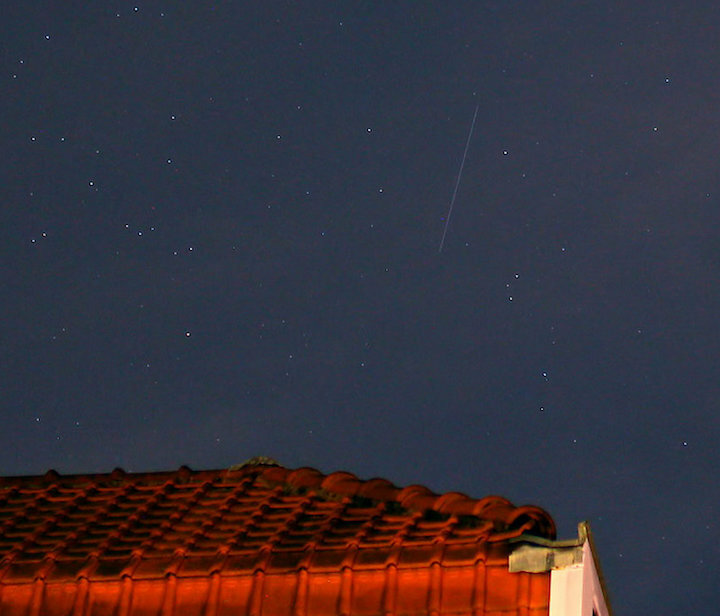 The secretive mission of a U.S. Air Force X-37B miniature space plane just winged past 500 days of flight. The robotic drone is performing classified duties during the program’s fifth flight. The current mission — known as Orbital Test Vehicle (OTV-5) — was rocketed into Earth orbit on Sept. 7, 2017, atop a SpaceX Falcon 9 boosterfrom Launch Complex 39A at NASA’s Kennedy Space Center (KSC) in Florida. X-37B missions are carried out under the auspices of the Air Force Rapid Capabilities Office, and mission control for OTV flights is handled by the 3rd Space Experimentation Squadron at Schriever Air Force Base in Colorado. This squadron oversees operations of the X-37B Orbital Test Vehicle. This Schriever Air Force Base unit is tagged as the Air Force Space Command’s premier organization for space-based demonstrations, pathfinders and experiment testing, gathering information on objects high above Earth and carrying out other intelligence-gathering duties. Each X-37B/OTV mission has set a new flight-duration record for the program. OTV-4 conducted on-orbit experiments for 718 days during its mission, extending the total number of days spent in space for the OTV program at that point to 2,085 days. It was launched in May 2015 and landed in May 2017. Air Force officials haven't divulged much about the current mission. But they have revealed that one payload flying on OTV-5 is the Advanced Structurally Embedded Thermal Spreader, or ASETS-II. Developed by the U.S. Air Force Research Laboratory (AFRL), this cargo is testing experimental electronics and oscillating heat pipes for long-duration stints in the space environment. According to the AFRL, the payload’s three primary science objectives are to measure the initial on-orbit thermal performance, to measure long-duration thermal performance and to assess any lifetime degradation. Exactly when the space plane will land is unknown. 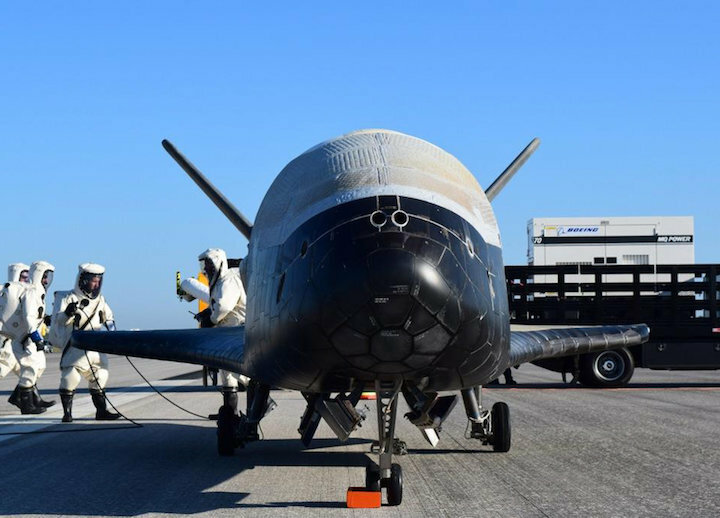 The previous X-37B mission touched down at KSC's Shuttle Landing Facility on May 7, 2017 — a first for the program. All prior missions had ended with a tarmac touchdown at Vandenberg Air Force Base in California. Several website postings say that the Air Force aims to launch the sixth X-37B mission, OTV-6, sometime this year aboard a United Launch Alliance Atlas V (501) rocket. The liftoff would be from Cape Canaveral Air Force Station’s Space Launch Complex-41. The classified X-37B program "fleet" consists of two known reusable vehicles, both of which were built by Boeing. The Orbital Test Vehicles were fabricated at several Boeing locations in Southern California, including Huntington Beach, Seal Beach and El Segundo. The program transitioned to the U.S. Air Force in 2004 after earlier funded research efforts by Boeing, NASA and the Defense Advanced Research Projects Agency. Looking like a miniature version of NASA’s now-retired space shuttle orbiter, the military space plane is 29 feet (8.8 meters) long and 9.6 feet (2.9 m) tall, with a wingspan of nearly 15 feet (4.6 m). The X-37B space plane has a payload bay measuring 7 feet (2.1 m) by 4 feet (1.2 m) that can be outfitted with a robotic arm. Each X-37B has a launch weight of 11,000 lbs. (4,990 kilograms) and is powered on orbit by gallium-arsenide solar cells with lithium-ion batteries. Prior to the launch of OTV-5, Randy Walden, the director of the Air Force Rapid Capabilities Office, said there were many firsts on this mission, making it a milestone for the program. "It is our goal to continue advancing the X-37B OTV so it can more fully support the growing space community," Walden said. The Air Force also noted that the fifth OTV mission was launched into, and will be landed from, a higher-inclination orbit than prior missions to further expand the X-37B’s orbital envelope. Ted Molczan, a Toronto-based satellite analyst, told Inside Outer Space that OTV-5 began September 2018 in an orbit about 243 miles (391 kilometers) high, inclined 54.5 degrees to the equator. Its ground track repeated every three days, after 46 revolutions. "In mid-September, it lowered its altitude to 214 miles (344 km), which caused its ground track to repeat every two days, after 31 revolutions," Molczan said. "It appeared to still be in approximately that orbit when last observed, on January 26, by Alberto Rango, from Rome, Italy." Repeating ground tracks are very common, Molczan said, especially for spacecraft that observe the Earth. "I do not know why OTV has repeating ground tracks," he said. 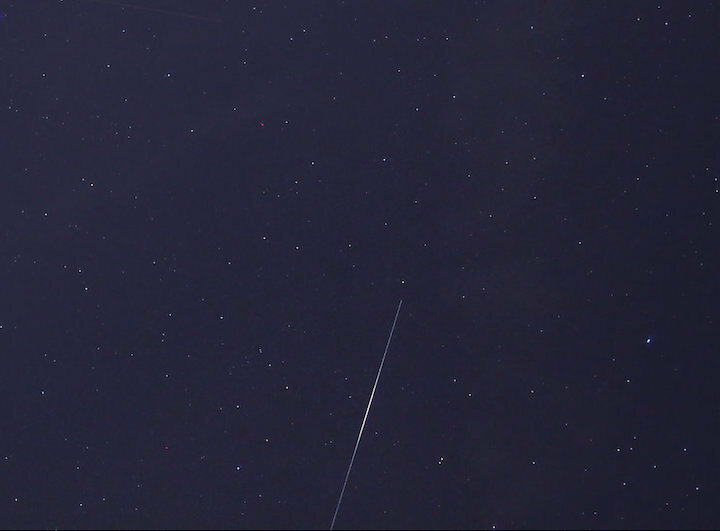 Kevin Fetter, an amateur Canadian satellite spotter in Brockville, Ontario, caught the OTV-5 craft zip by above a bright star.